It may not be THE derby for Burnley. That comes a week today when Blackburn Rovers come to Turf Moor. But Clarets midfielder David Jones isn't looking beyond today's local tussle at Bolton Wanderers. The "one game at a time" mantra which served Burnley so well in their promotion campaign two years ago remains in place. Sean Dyche's side can go top of the Championship with a win today, and Jones said: "For the fans, I know the next one is the big one,but for us each game is massive at the moment and we’re just looking to continue what we’ve been doing. "As a player you notice there’s a lot more attention on the derbies. You feel the anticipation from the fans when these big games come around. “We look forward to them, and they’re a good atmosphere when you play in them. “You are aware of it but as a player but as a player it’s how you deal with that emotion. “There’s a different feel to them sometimes, these derbies, and you have to put that to one side and concentrate on the job in hand, which as a squad we seem to do pretty well." 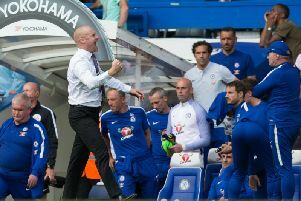 The old cliche is that form goes out of the window in derbies, but Burnley are looking to maintain a fine sequence of results, have gone 10 league games without defeat: “I think it always helps when you’re playing well and getting results. “We’re just going to continue with the good mentality that we’ve been showing in the games and the good performances, if we can replicate those from now to the end of the season, that’s the main aim. "It’s so tight, there are a lot of teams up there and any team can put a good run together. “There’s not much between us at all so it does become more relevant than ever now. “In my three years here at the club that has always been the mentality anyway. “13 games. I’m looking forward to it. There are still a lot of points to play for but I’m really looking forward to the coming weeks and coming games because we’ve got some big ones coming up. “We’ll stick to one game at a time. “The focus, we’re quite boring just to look at the next game, but it looks after itself that way and I think that’s worked for us. "The squad does think like that and the manager has bred that mentality in us so when we step out onto the pitch that’s all we’re looking to do because we know that every game in this Championship there are teams who can make it difficult. "Rotherham was a tough one for us, they’re fighting for their lives, Bolton are going to be the same. There’s no team that rolls over in this league at all so we know we’re going to have to be going hard being full of tempo and full of quality for these remaining games to get the points that we want." Wanderers have only won four times this season, but Jones knows they won't be a pushover: “Bolton’s always a tough place to go to, they’ve got some good players, a good manager and they’re fighting for their lives down there. “You never get an easy game at Bolton. They can’t be underestimated."